People either love it or hate it—but no matter what, Los Angeles makes no excuses and changes itself for no one. And you’ve got to admire that. Made up of dozens of communities, there is not one single experience that can sum up the life and heartbeat of this city. But what can be noted about Los Angeles by both tourists and locals alike is the hustle-and-bustle lifestyle, the vibrant and unique neighborhoods, and the extreme diversity that sets it apart from any other city. From the eternal sunshine and Hollywood glitz to all the small communities with their own distinct cultural personalities, this City of Angels will forever be many things to many people. 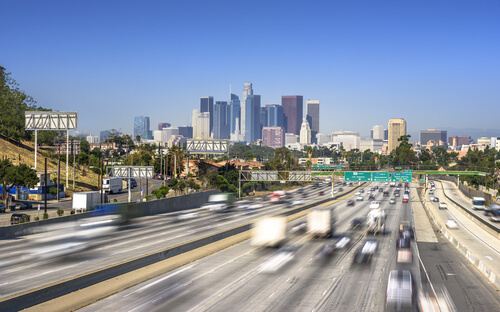 – Almost a quarter of the land area of Los Angeles is taken up by automobiles. – There are fewer people in LA than there are automobiles. – Los Angeles is the second-largest city in the United States. – Beverly Hills has the highest average number of bathrooms per house in LA County.